Fancy enjoying the good life in the lakeside resort of Wanaka in central Otago? Well, Wanaka Computers has vacancies for two staff. The business is run by Linda Montogomery and Rob Facer, who met each other 20 years ago while doing their OEs in London. Facer, originally from Christchurch, did an IT course in London and spent 10 years in various roles before managing a business delivering internet, email and security for large organisations. He then spent time on contract freelancing, specialising in Windows support and Lotus Notes support. Montogomery, meanwhile, hails from Lower Hutt and was a planner for a consultancy. Her OE included a stint at The Hague and organising PCs at the headquarters of Shell. For 10 years she worked for ComputerCentre, a large IT reseller. They returned to New Zealand in 1999 and spent a few years in Tauranga. It was during a holiday in Wanaka that the couple decided to move there and buy a house. “We started the business straight away. We had been doing IT for so long in the UK, it was a natural skill,” she says. 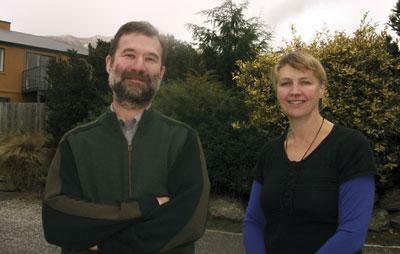 The pair say they usually employ two staff, but find it difficult to hire people in Wanaka because it is a remote location and employees need to have particular skills in small business servers. “One [former staff member] was Chinese, but his wife wanted to return to Auckland. The other was on his way overseas to do his OE,” says Montogomery. She says there are pros and cons to working in the region. “The salaries don’t compare favourably with Auckland and Wellington, but on the flipside you have a small town and a magical environment. It is really nice for the kids, it is safe, a great community. There are a lot of interesting people in Wanaka,” she says. Facer says previous online advertisements would get many applicants from Indonesia, Pakistan and India, but this time an advert on Trade Me led to more local applicants. Montgomery and Facer say they focus on small and medium businesses as well as home users and, because of the location, the client base includes tourist accommodation providers, retailers, golf clubs and home businesses. The company’s work typically involves server support, upgrades and installation of hardware, along with software sales, security and email. The couple say working from home means there is usually someone to answer the phone and provide service. It also means more flexible working hours and less time spent travelling. Custom comes from the greater Wanaka area, the Upper Clutha district, Haast and Queenstown. The pair are considering a retail presence and office in a commercial area, but remain home-based for the present. They experienced a three to four month slowdown in computer purchases during the recession, but say work has since recovered. “[In the] colder seasons ... tourism businesses want to do their upgrades and projects,” Montgomery explains. Once the staff have been recruited, the couple plans new services for the business, saying there is work in the pipeline and a great deal of potential, because companies are “doing things” again. But this depends on getting staff who are seeking a good lifestyle, particularly involving outdoor activities.